In 2003, Jennifer participated in the Walter Turken Training for Adoption Program. As she fulfilled her volunteer commitment, she realized she would enjoy helping dogs become better family members. She began apprenticing with professional trainer Marc Street. 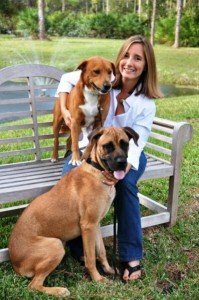 Jennifer graduated from the Triple Crown Dog Training Academy as a Certified Training and Behavior Specialist in 2003 and returned to her apprenticeship to garner further knowledge in a real world environment. In conjunction with Marc, Jennifer utilized her business experience to found a training program at a prominent local veterinarian’s office. While running Canine Coaches, she also developed and grew the training program at Very Important Paws. During this time Jennifer helped countless pets and their owners form better bonds and happier families. Jennifer also worked with various programs to help make shelter dogs more adoptable including the Walter Turken Training for Adoption Program at Peggy Adams Animal Rescue League and SPCA Tampa Bay as well as DTAP at Palm Beach County Animal Care & Control. In 2011, she turned her attention to service dogs in Florida. As Director of Training for a local service dog organization, Jennifer trained mobility assistance dogs, hearing assistance dogs and PTSD assistance dogs for veterans and others in the community. Jennifer joined the Genesis Assistance Dogs, Inc. family as the Director of Training in December 2013.